When Disney bought Lucasfilm in 2012, Star Wars fans around the world rejoiced, as the franchise was finally removed from the hands of George Lucas, the man most people blame for the much hated prequels. Disney wasted no time in planning a slate of Star Wars movies, with one coming out each year starting now. They then swiftly hired JJ Abrams, who already brought Star Trek back to great acclaim, to helm the first of these new films. Years of speculation, teaser trailers and rumors later, and the newest adventure in a galaxy far, far away is finally here. But does it measure up to the beloved original trilogy? The Force Awakens begins thirty years after the events of Return of The Jedi, and the galaxy is once again in turmoil. Legendary Jedi Luke Skywalker has disappeared, and a new threat named The First Order has arisen from the Empire’s ashes. The only clue to Luke’s location is in the hands of a little droid called BB-8. 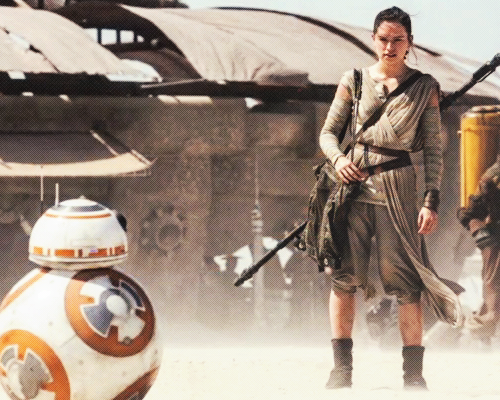 In order to deliver this information to the resistance, BB-8 teams up with scavenger Rey (Daisy Ridley) and ex-storm trooper Finn (John Boyega). Together, they will venture across the galaxy, meeting familiar faces such as Han Solo (Harrison Ford) and Leia Organa (Carrie Fisher), and facing off against the evil Kylo Ren (Adam Drive) in order to restore order to the galaxy, and find Master Skywalker. I really want to know what kind of deal with the devil JJ Abrams made that landed him the chance to direct not only the Star Trek reboot, but also the newest Star Wars. Abrams has made it clear that he is a huge geek, and has nothing but love and admiration for the franchise, and that is evident throughout The Force Awakens. It’s one big love letter to Lucas’ original trilogy, and puts in as much fan service and call-backs as it can. I dare anyone in the audience who loves the franchise to not cheer when the Millennium Falcon first appears on-screen. But in many ways, The Force Awakens is an improvement on even the best Star Wars movies, and that’s because of the script written by Abrams, Lawrence Kasdan (who co-wrote Empire Strikes Back and Return of The Jedi with George Lucas) and Michael Amt. They clearly learned a valuable lesson from 2014’s Guardians of The Galaxy: make sure the audience laughs. The Force Awakens manages to mine a lot of comedy from its characters. More than comedy, the script is also devoid of the more clunky and cheesy dialogue that was present in the Star Wars films. Visually, the film is as gorgeous as any modern sci-fi film could possibly be, with a seamless mix of practical effects and computer generated imagery. The film captures the dirty, western-y look of the older movies, while also making it feel new and modern. The various ships, aliens and droids all look authentic to the Star Wars universe, especially the delightful BB-8,who pretty much steals the screen every time he appears, and will most likely be the highest selling toy of 2016. The film uses motion capture to great effect, especially with the character of Maz Kanata (played by Lupita Nyong’o) who acts as the film’s Yoda figure. Of course, the king of motion capture, Andy Serkis, makes an appearance as the shadowy Supreme Leader Snoke, but plays only a minor role. For such a long time, Star Wars has been very concentrated on a set number of characters. Be it the Skywalkers (Luke and Anakin), Obi Wan Kenobi or Han and Leia, we haven’t had the chance to meet other people in the galaxy. That is something The Force Awakens changes, because much of the focus of the film is placed upon the three main newcomers: Rey, Finn and Kylo Ren, and they are each interesting, complex, and well written characters in their own way and all have something important to add to the film and universe as a whole. Finn, played brilliantly by John Boyega (who is inexplicably doing an American accent instead of his natural British), provides great insight and humanity into the storm troopers, who were basically faceless henchmen in the previous films. He is also kind of the bumbling sidekick, but never feels too cartoonish or dumb. Of course, he is often upstaged by the mesmerizing Rey. She is exactly the kind of hero the Star Wars universe needs right now. She’s not some occasionally proactive damsel like Princess Leia or Padme were, she is a tragic, riveting heroine, who doesn’t want to be a hero, but understands that the power she holds needs to be used for good. Unlike Luke, she doesn’t want to be a hero and have the responsibility that comes with the title. You can’t talk about Star Wars without thinking about Darth Vader, one of the most iconic villains ever conceived. Kylo Ren, the big villain in The Force Awakens, had some pretty big shoes to fill and manages to be even more menacing and cruel than Vader. That’s because unlike Vader, Ren is still very young and not in control of his powers. He’s impulsive and quick to anger, which makes him a very complex kind of evil figure, one that’s still not sure of himself and harbors aspirations that he is not yet ready to fulfill. There’s still that small chance that he can step away from the dark side, but his motivations (which are pretty much the big reveal of the film) make him the kind of bad guy you can, if not sympathize with, at least understand enough to make him much more of a human figure than Vader was. Adam Drive is doing some great work, and his already odd voice and facial features only serve to make Ren that much more threatening. And then of course, there’s the returning cast, a topic I won’t discuss too much because that’s where a majority of the more spoilery stuff comes in. I’ll just say that Harrison Ford immediately channels the performance he gave 30 years ago, and brings Han Solo back to life so completely and effortlessly that you would be missing a heart not to tear up when he first shows up. It’s fitting that this film should come along not long after Creed (another movie that reinvigorated a classic franchise) because Ford is essentially filing the same role Sylvester Stallone did in that movie. He is the emotional core of the movie, and you can tell that Ford is enjoying being back in the role that launched his illustrious career. Sadly, Carrie Fisher hasn’t returned to her role with the same gusto as Ford, and is only really effective when she shares the screen with the former. Now, comes the part where I have to give some criticism, but before you Star Wars fans come at me with lightsabers, everything I disliked about the movie really only had minimal effect. The main problem with The Force Awakens is that it pretty much takes all of the core plot elements of A New Hope, and re-imagines them much in the same way Abrams did by taking Wrath of Khan and making Star Trek Into Darkness. This is essentially a re-quel (sequel and remake), which isn’t necessarily a bad thing, except for those of us who wanted to see the franchise do something a little different. I understand that this movie is trying to re-introduce the Star Wars universe to a younger audience that might not have seen the older films, but for someone who has, I feel just a little bit cheated out of a new story. These similarities pop-up every now and then, and although they are never distracting or deter your enjoyment, they do make you wish Abrams and company would have tried to come up with a more original plot. That being said, the characters are so different from those in A New Hope, that it changes the core dynamics, even when the movie outright steals exact scenes and dialogue from A New Hope. Another minor complaint I have with the film is that there are so many interesting characters introduced, that not many of them get the screen time they deserve. Oscar Isaacs is great as X-Wing pilot Poe Dameron and Gwendolyn Christy poses quite the figure as Captain Phasma, but both enter and exit the screen before you can fully appreciate their presence. George Lucas said it best himself when he gave his own review of the movie: Fans are going to love it. As a fan myself, I wholeheartedly agree. It’s clear that Abrahams and company knew exactly what elements from the original films to keep (and reuse) and which to ignore completely. Even though it does go a little too far on the fan service elements, The Force Awakens is the Star Wars movie we have all been waiting for. The terrific new character brought to life by the talented cast, the emotional elements relating to the returning characters and the visually stunning effects all combine to form a truly great sci-fi epic that will inspire a whole new generation of viewers to be one with The Force. I would be sad that Abrams is not returning for Episode VIII, except for the fact that he is being replaced by Rian Johnson who, if his movie Looper is of any indication, is capable of crafting a much more original story than Abrams. No matter what the future holds, I’m sure of one thing: Star Wars is back, and better than ever. Share the post "Star Wars: The Force Awakens Review: Welcome Back to a Galaxy Far, Far Away"